Four higher ed IT leaders discuss the "bring your own everything" phenomenon, its impact on teaching and learning, and its challenges and opportunities. "Bring Your Own Device," or BYOD, has been an ed tech buzzword for so long that it's hard to imagine a learning environment without student-owned laptops, tablets, smartphones and the like. In fact, in its 2015 Top 10 IT Issues, Educause referred to BYOD as part of "the new normal," pointing out that technologies such as mobile, online education, cloud and BYOD are forcing IT to retool and redefine its support strategies and security policies. Yet while BYOD may be commonplace, it's also evolving — growing to include not just devices but networks, cloud services and more. The expanding definition of BYOD has earned it a new acronym: BYOE (bring your own everything). "What began in the last decade as a faculty or staff member connecting a personal laptop to the campus network has exploded into an ever-growing ecosystem of personally owned smartphones, tablets, cloud storage, processing, and other individually owned technologies that are everywhere we are," wrote Mark Askren, CIO at the University of Nebraska-Lincoln, in the ECAR research report "The Consumerization of Technology and the Bring-Your-Own-Everything (BYOE) Era of Higher Education." CT asked Askren and three of his higher ed IT peers about BYOE on their campuses, its impact on teaching and learning, and its challenges and opportunities. CT: How is BYOE impacting your campus? Joy Hatch: Take a walk across any campus in the nation, and probably the only people not using a technology device of some sort would be faculty and staff. The students are all heads-down typing or reading texts, or social media posts, and perhaps e-mail if they are looking for an assignment. In the residence halls it is even more pervasive with students and their gaming devices, video players and an occasional desktop here and there. Not so long ago, I remember banning anything with an Apple logo because it was difficult to support. But the iPhone started a revolution, and the iPad kicked it up another notch, so today you have tablets of all flavors — Apple, Android, Surface, Kindle and more — appearing all over campus, mostly for personal use, but now these devices are sanctioned for business use also. If you are fortunate enough to have your institution purchase a tablet device for you, great! However, even if you have to buy your own, chances are you will. The devices are small, portable and easy to use — which makes them ideal for both classroom and meeting room usage. Duane Schau: The explosion of personal devices is changing the way students want to learn and the way they want to manage their university business. Nearly all Indiana University residential students come to school with a laptop computer and a smartphone of their choice. A one-day snapshot of student wireless registrations on April 6 and 7, 2015 shows 34,344 wireless registrations at our Bloomington residence halls — with 541 distinct device types and 32 unique operating systems. Analysis provided by Mary Meeker's Internet Trends 2015 shows Americans now spend 29 percent of their screen-viewing time (time spent on screens other than traditional televisions) on multiplatform devices such as smartphones — up from 5 percent five years ago. We can expect our students feel comfortable accessing information from smart devices. Additionally, they will want the convenience of a smartphone app for course registration, finances, security, dining and more as a part of their student experience. With one.iu.edu, Indiana University students can quickly access services and information on almost any device, often from one click. Thomas Hoover: The University of Tennessee at Chattanooga has had a significant increase in BYOE. In spring 2011 the number of mobile devices was 3,833; spring 2015 we had 18,995 devices. This makes IT feel a significant amount of pressure on our aging infrastructure. The first day of class in fall 2014, a router was overloaded due to the increase of traffic. This failure caused our network team to implement stopgap measures, reworking the system to make things work without a loss of service to campus. We had to do an upgrade that night in order to keep our service level to the campus. At UTC, 75 percent of our on-campus network traffic is wireless. Our original network was not designed for this. We have to play catch-up in order to sustain, maintain and plan ahead for future increased use. Mark Askren: BYOE hasn't impacted us much yet, even though it's becoming pervasive. The feared downsides of personally owned end-user devices have not been significant in our experience. And it's too early to realize the positive reallocation opportunities, as we still have most of our classrooms and student computing labs populated with university-owned computers. We are seeing the start of the transformation in that our numbers of student lab computers are decreasing in spite of rising enrollment. BYOE allows us to enter a pattern of reallocating spend from lab and classroom desktop computers. Where the investment is needed now is increased wireless density in the classroom and study spaces, including some outdoor locations. Device refreshes at scale are expensive, and when students are making those personal investments for devices of their choice it frees up money to spend on improvements in other parts of the student technology fabric. CT: How will BYOE change teaching and learning? Hoover: Bringing devices allows classrooms to become the world: There is access in a virtual classroom 24/7. This can make the faculty member more of a facilitator for learning, rather than the original model of instructor as the only access point. Students can use devices to access a wealth of knowledge and to teach others around them. The access to information that students have now is unfathomable. That creates a tremendous amount of learning potential that can come from this data. Askren: BYOE changes both the faculty and the student experience and this can be a positive. For faculty we are interested in providing a technology-ready classroom that seamlessly allows them to connect their own mobile device of choice. This may be a laptop, tablet or even smartphone. The students' experience is enhanced when they're able to bring their personal devices into the classroom to interact and capture ideas from key conversations. 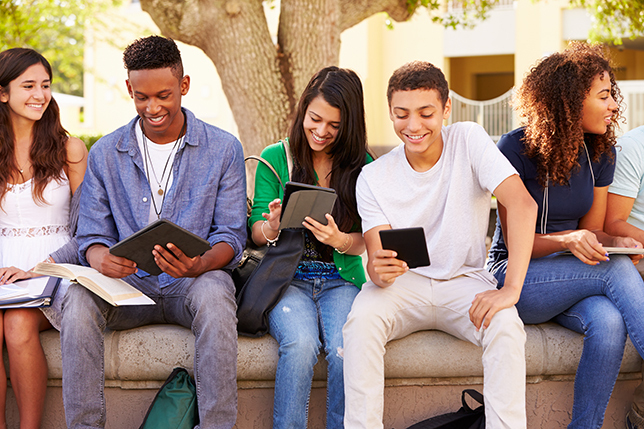 An example of progress is the students' use of their own smartphones or tablets as a clicker, a notes-taker, an interactive device connected to the LMS and student system, as well as being able to participate in social media sites simultaneously. Schau: Our students at Indiana University expect convenience as well as an experience tailored to mobility. Analytics indicate our students make high use of mobile devices to learn from the world. Our Learning Technology division is architecting the next-generation virtual classroom with the primary engineering goal of a "zero-touch" user experience for IU online. Zero touch requires that software applications and course and exercise files for the class be set up ahead of time, so that on the very first day of class the student can log in to vPC and start learning. Students expect to share and receive content from their favorite apps such as Twitter, KakaoTalk, Line and others. Faculty will have to adjust transparency at the speed of thought as we adopt a new-generation style that values speed, depth and agility of communication tools. Consumer and marketplace technologies will continue to allow students to access course content anywhere in the world, on low-cost devices such as PC sticks or their smartphone. All of this lowers the costs of access to teaching and learning while improving the student experience. Hatch: Faculty also participate in BYOE, and they use the technology to enhance their classes. There are still classes where the faculty member says "no devices of any type allowed," but that number is decreasing. Faculty are beginning to take advantage of students bringing tablets and cell phones to class and will have the students use them for in-class activities — with a flipped classroom model, but also to add interactivity to the content. There is a downside to the technology dependency. Faculty should always have a backup plan in case the technology gremlins come to class, but those faculty who teach in international programs could have an even bigger surprise in store for them, depending on the country. I have just returned from a two-week trip to China where I was able to attend commencement at our partner schools and talk to both students and technical staff. Visit a tourist attraction or go to a restaurant and everyone is using an iPad for pictures. On the campuses, everywhere you look students have cell phones and are texting or surfing the Web or doing their version of social media. But at several of the universities I visited, there was no wireless access for students. Talking to the faculty I heard stories about slow connections, unavailability of the LMS (located on the campus) and many more scary stories. They talked about having to be prepared to do a lesson without technology because you never knew what might work and when it might work. Even asking students to use their devices would often not work. One faculty member said that their new methodology was to use paper and pencil, and plan classes without the use of technology. This situation will change in time — and higher education is likely pushing it — but until such time, technology can be a struggle. CT: How does BYOE change your IT strategy? What kinds of challenges does it create? Hoover: Information Technology's core responsibility is having a solid, stable infrastructure; without it nothing is possible. A campus can have new wireless AC units, but if bandwidth and network core aren't working flawlessly, the new wireless units are worthless. We are finding that our aging network equipment is not able to handle the increased network demands. The days of being able to reuse network equipment are gone. We are trying to institute a real network refresh plan to accommodate these new demands and increased expectations by our students, staff and faculty. Demand for coverage is only going increase. Hatch: BYOE creates challenges in multiple areas, but it has to be part of the strategy when it comes to planning for the future. Areas where BYOE will play a major role in strategy include infrastructure and security, with support coming in closely behind. The continual usage and increasing number of devices place a larger demand on the wireless infrastructure every day. For instance, the start of each semester brings more and more devices connecting to the network — graduation presents for the new freshmen and new tech toys at Christmas time for all campus constituents. Everyone expects to have the same access on campus as they do at home, and some even expect more. The supply of bandwidth is pushed by the demand from BYOE devices on campus. Security is a major concern for BYOE, and one that is harder to resolve. The traditional BYOE devices are mobile, typically small and thus prone to loss. Users are unaware of the potential vulnerabilities that can be found in apps, through wireless signals such as Bluetooth and in more ways than I can even comprehend. Little things like birthdays and hometowns, likes and dislikes can lead to identity theft, and all are usually available online somewhere. And, for users who have confidential or sensitive information on their phone, the risk to the institution is even greater. Cybersecurity awareness is difficult to achieve, and BYOE only adds complexity to the equation. There are various methods in use across all of higher education, but the understanding of the problem is growing at a snail's pace. Fort Hays has just appointed its first information security officer, who is looking for initiatives to help educate students and employees on the dangers related to BYOE devices. Askren: BYOE cloud storage for university data can be problematic if not managed effectively. We're comfortable with using the cloud for storage for the majority of our data, but the key point is that it be done under a university contract that provides increased protection for the institution and the faculty, staff or students involved. In our case we've contracted with Box through an Internet2 Net+ agreement, which meets our needs very well. The ongoing challenge is to let everyone on campus know about this service. We work to ensure that they're using our standard cloud storage service for university data rather than a consumer service they've purchased on their own. CT: What does the future look like? What opportunities do you see? Askren: We're already to the point where almost everyone has a family of devices that they personally own and regularly bring to campus (laptop, tablet, smartphone and, in some cases, wearables). The difference is there is no longer going to be a company- or university-owned overlapping set of laptops, tablets, etc. As is currently the case with home network connectivity and smartphones, in the near future there won't be the need or value for us to provide a redundant set of devices to faculty, staff and students. We instead can continue to focus on campus connectivity and add additional services, and let our clients choose their own endpoint devices. Hoover: The future is being more connected and dependent on the network. Soon cell phone voice transmissions will be traveling over our networks instead of through carrier cell towers. While alleviating data on towers, the drain this will place on infrastructure will be immense. The end users on campus — students, faculty and staff — will have no visibility to this different data transfer. Information Technology has to plan ahead for 100 percent uptime. This will be absolutely essential for success on campus. Any downtime will be unacceptable and could have detrimental effects on the institution. The future is also full of wearable devices, a stunning sense of lack of security and the basic acceptance that users need 100 percent coverage and transmission all the time, everywhere with no interruptions. Information Technology will have to strive to protect user data through transmissions, end devices and data centers. Hatch: The future of BYOE includes even more devices and even more bandwidth utilization and even more issues with things like security and support — but it is a very exciting future. The Internet of Things will keep everything connected and we will see even more data coming in that has to be processed. The recent surge in "health" with devices like Fitbit is a great example. Future devices and/or clothing could monitor water intake and include health monitors that report directly to a doctor or nurse — hopefully helping prevent major health attacks from happening. The next version or two of Google Glass will demand that society figure out the privacy issues surrounding these devices, and then they will become commonplace. From a CIO perspective, I would love to see the day that users provide their own technology for work — and IT stops demanding you use a certain brand of machine and OS. This would be a major paradigm change for FHSU and will require major changes in the way support is provided. It will probably also necessitate a virtual desktop environment and create new issues like storage space, backups and availability. FHSU is not quite ready for this drastic step, but I still believe it can help the university be more efficient. Schau: The learning classroom will transform with the use of sensors that will automate various customizations that today can be very complex. Facial scanning technologies, soon to be a part of the new-version OSes, may be used (after proper security and privacy vetting) to validate a student in a university testing center or in the comfort of a student's residence anywhere in the world. New technologies such as those in development from Octoblu or Intel allow us to use common device protocols and workflows to automate classroom technologies, offering more convenience and certainty. Opportunities for universities to establish and resource "maker labs" open doors for students to lead in the design and implementation of new technologies of the future, becoming a pipeline for creativity empowering the mission of teaching, learning and research.